While it is tempting to eat for two while pregnant, a healthy daily menu for pregnant women only includes 100 to 300 more calories than the same woman should eat if she were not pregnant. The female body is efficient at converting very little 'extra' into a healthy baby along with all the extras associated with the baby, such as several pounds of amniotic fluid and a modest reserve of fat stores for breastfeeding once the baby has been born. Pregnant women should steer clear of a few foods, but for the rest, it's everything in moderation. Pregnant women should take general healthy eating advice very seriously: limit sweets (choose fruits or natural fruit juices instead), limit fats (especially saturated fats) but don't cut out fat completely, and eat a varied, healthy diet based on vegetables, fruits, whole grains, and low-fat protein. Minimize, if not cut out entirely, fried foods and be sure to consume at least four servings of low-fat dairy per day for calcium (low-fat milk, yogurt, or cheese). Where a pregnancy diet varies from general healthy-eating guidelines is in the specific limitations that can harm the baby or harm the mother's ability to protect the fetus. Unpasteurized milk: check cheeses and other dairy products for ingredients, making sure that the milk used to make the product was pasteurized. Unpasteurized milk can harbor bacteria dangerous for the fetus. Deli meats and paté: these should be avoided for the same reason as unpasteurized milk products. Raw eggs, meat, and fish: raw meats can contain harmful bacteria, just like the milk or paté made from these animals can. Ensure that eggs, red meat, and fish are cooked thoroughly before consuming; remember that homemade mayonnaise and treats like chocolate mousse or egg-nog can contain raw eggs. Also note that products like smoked salmon are, most often, raw. Alcohol. While some wonder if even a small amount of alcohol is harmful, it is best to avoid alcohol altogether during pregnancy. In cooking, only eat foods that have been cooked at length (about an hour) that contain alcohol; dishes that have alcohol added to them in the last moments of cooking should be avoided. While fish is an important part of a pregnancy diet because of the omega-3s it contains, pregnant women should limit fish consumption to six to twelve ounces per week due to mercury's effect on the fetus. Stick with white fish, salmon, or tuna, and avoid shark and swordfish altogether as these are known to contain high levels of mercury. If you want to cut out fish completely because of fear of mercury effects, be sure to include flaxseed, soybeans, eggs, and nuts (especially walnuts) to your diet as these contain omega-3s as well. Generally speaking, it is a good idea to limit caffeine consumption during pregnancy. While doctors do not agree on exact recommendations, there is ample research connecting caffeine consumption with increased risk of miscarriage in some groups of women, as well as possible adverse effects on the fetus. Limit yourself to one or two cups of regular strength coffee a day or enjoy several cups of green tea or three to four cups of black tea. Herbal teas can be enjoyed without limit. 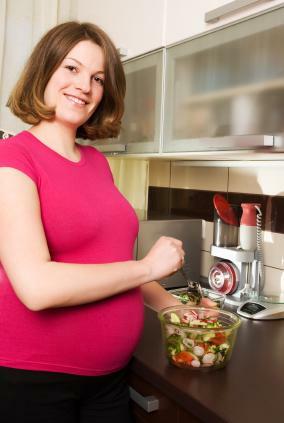 Pregnant women may find it helpful to eat several smaller meals than three large meals a day. Start with a healthy breakfast: whole grains, dairy, and fruit. A quick version would be whole wheat toast with a glass of milk and a piece of whole fruit. Alternatively, make yourself homemade oatmeal with lowfat milk instead of water and add some blueberries and strawberries for a sweet treat. A good morning snack is a piece of bread with peanut butter or lowfat cheese, an apple with peanut butter (spread thinly), or a yogurt (check the ingredients and choose yogurts that do not contain artificial sweeteners--if you can't find any, select a plain yogurt and add a teaspoon of no-sugar-added jam). For lunch, pack your sandwich with whole grains, low-fat protein and veggies. Try turkey breast with cheese, mustard, and veggies, or tuna fish with veggies. Add yogurt or milk if you are not yet on track for four servings of dairy. Great afternoon snacks include a handful of nuts (not every day because they're high in fat), a piece of fruit, carrot sticks with hummus, or rice cakes with cheese or peanut butter. A special menu for pregnant women need not cost a fortune or take more time planning than your average weekly menu. Pregnancy is one of the most important times in your life for healthy eating, and the importance of healthy eating during pregnancy is so established that it can become a source of stress. There's no need to stress about your diet as long as you avoid a few key items and aim for a varied diet high in fruits, vegetables, and whole grains.